THE spirit of the walk of Christ with the disciples to Emmaus at eventide is reproduced in the hymn, "Abide with me." This has been sung at the close of many a day, and, indeed, of many a Christian life, as believers have uttered it as a prayer for the presence of Christ. It was composed one Sabbath evening in 1847 out of a deep sadness that had settled down upon its author, the Rev. Henry F. Lyte. 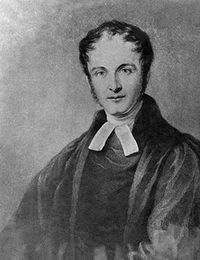 He had conducted his last communion service that day at the close of a pastorate of twenty-four years at Brixham, England. A fatal illness had already seized him and he was about to leave England to prolong his life, if possible, in the South. Toward evening he walked down his garden path to the seaside, and there thought out the imagery and many of the lines of his famous hymn. Into this he has woven the sense of change and of helpfulness that one must feel in the presence of death, and also the trustful dependence upon Jesus Christ, the "Help of the helpless," which every true Christian must feel in that solemn hour. whispering the words "Peace! Joy!" while he was pointing his hand upward, he died. This hymn, "Abide with me" was very popular in the battle trenches of the First World War. It is also remembered as a song sung by British Nurse Edith Cavell the night before the Germans shot her for helping British soldiers to escape from occupied Belgium. Abide with me is also a favorite hymn of the British of the Royal Family. It was played at the weddings of the future George VI to Elizabeth Bowes-Lyon and their daughter Elizabeth to Prince Philip. It is a fixture of the FA Cup final, Anzac Day and the British Legion’s Festival of Remembrance at the Royal Albert Hall. On Sept 21, 2001 it was unforgettably played at Ground Zero by a Salvation Army band during the commemoration of the September 11 attacks. It also features on the soundtracks of several movies – The Full Monty, 28 Days Later, A Bridge Too Far – and is always associated with mourning and tragedy. Below are the lyrics of this great hymn.